When it comes to giving presentations, one of the biggest names is PowerPoint. There are other great products out there like Prezi but just about everyone has at least heard of the orange themed member of Microsoft’s Office Suite. Microsoft doesn’t have any plans to change that with their new app, Sway, but they have added another player to the presentation game. Sway is a web-based presentation software that can take media from multiple different sources. You can easily embed tweets, YouTube videos, your personal files from your PC or OneDrive, and a lot more. Microsoft is working on adding support for more services and already has one polling site, Poll Everywhere, supported and a preview for interactive charts. The entire Sway interface is based on “cards” which contain your media content. When you make a Sway you can easily change between customizable themes. You also have the option to change if your Sway slides up and down, left and right, or switches between pages left and ride. Adding cards are easy enough as you can insert text, media content, and more just by clicking the add button or using the insert functionality. I found that the interface takes a little getting used to since it is different from any other program I’ve used but once it’s learned it’s pretty easy. 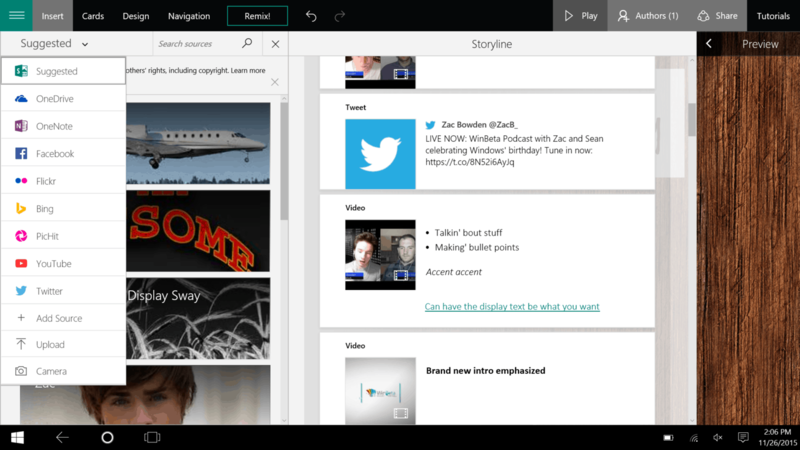 Sway lets you search for content to add. 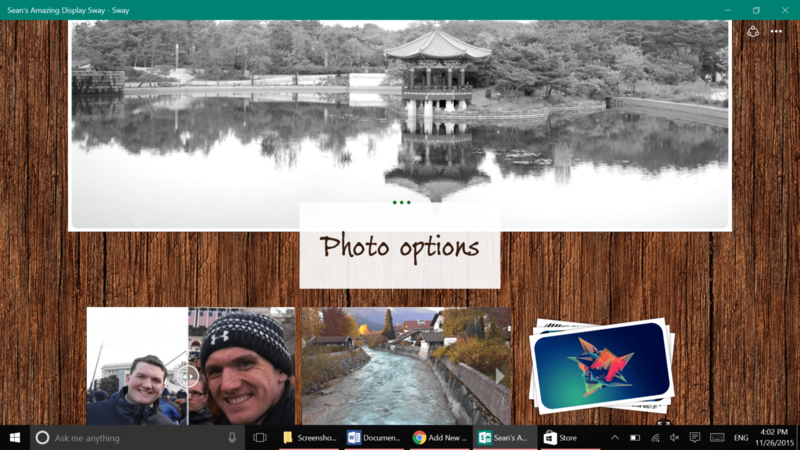 You can search Twitter, YouTube, Bing and more and drag and drop items into your Sway. It also has suggestions based on what it thinks would fit into your presentation. One of the strengths of Sway is how it presents photographs. In addition to supporting programs such as Flickr, you can easily add your own photos or web results. Options for laying out your photos include slideshows, slide bar comparisons (which is a great feature), stacked layout, and simple grouping. If you went to an event or a family vacation and want to share a presentation, I would recommend at least looking at Sway. Being relatively new, I wouldn’t say Sway is perfect. It’s solid in concept and in large amounts practice but at times can be slow. It’s worth noting I only used it on my own personal PC so it could be an isolated issue, but I found that changing themes, remixing the Sway, and changing how Sways navigate lagged at times. Sways are easily shareable for both authorship and just with friends or family. This makes it a great app for making and sharing presentations. It especially shines as a way to collect memories and to share. I don’t think it’s a product that many people know about yet, but I think over time it could fall into a good niche of easy to customize presentations. Update: Here is the OneDrive folder for uploading wallpapers. What's your favorite presentation program or software?